Nate Wilson thanks guest speakers from the U.S. Army and the FBI. Students in security and management at Webster University's National Capital Region campus locations enjoyed a chance to hear career stories from two people in the field at a joint gathering on July 7. 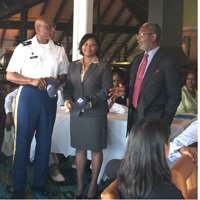 Faculty members Nate Wilson and Gybrilla Blakes’ classes, SECR 5090: Behavior Issues and MNGT 5950: The Woman Manager, went to the Chart House in Old Town Alexandria, Virginia, to hear U.S. chaplain Eddie Kinley and FBI profiler Jo’El Myles speak about their professions. Chaplain Kinley, who decided to join the army when he was 37, began his discussion by saying he felt as if he was born to be an army chaplain. The father of four decided to pursue a career in family and marriage counseling, concentrating on the difficulties of stability in the military household. He discussed the differences between nuclear families, blended families, single-parent families, adoptive families, and gay and lesbian families. He then touched on the challenges these military families face in today’s society. “You’re moving at least once every three years,” he said, “and coming back from a year-long deployment is hard.” Kinley noted that when one parent comes back from a deployment, it may be hard to reconnect with his or her children since the other parent played both the mother and father roles during the length of the deployment. The chaplain also discussed divorce, PTSD, addiction, and premature marriages, and how he helps families deal with reintegration. On the opposite end of the spectrum, Jo’El Myles walked the two classes through a day in the life as an FBI profiler. As a curriculum manager, Myles provides research and insight on how to train FBI agents, liaises with internal and external law enforcement, and works directly with the Behavioral Analysis Unit. Myles considers herself a “silent third party” when it comes to investigating crimes, as she is the one who reads reports, reconstructs crime scenes, and looks through photos for evidence. “If you don’t have a good foundation, this job can be very overwhelming,” she warned the students. During her question and answer portion, Myles commented on when and how the FBI gets involved with a crime scene. She told the students it normally happens when the local governments can no longer be unbiased about the crime at hand, and that the FBI always launches its own separate investigation. Although she couldn’t comment on active investigations, she did tell the students that it is difficult for her not to take the job home. Despite the fact that she has to look at horrifying pictures and read detailed reports of heinous crimes, she always tries to manage what she sees and to look for the good in all people. Both the security and the management classes came away from the speakers’ discussions with a plethora of information. The students got to hear about the fundamental, human side of military families that often gets overlooked as well as what it is like to work in a high-profile yet enigmatic positon.